Individual passions glide on America’s highways in different forms. Some folks pursue their quests of visiting all National Parks within a summer. Others carry kayaks to challenge rivers from Maine to Oregon. Still others climb mountains in pursuit of their Holy Grail. Fly-fishermen-women pursue that speckled trout in high mountain streams. Somewhere out there on the roads that crisscross the planet, an adventure-seeker pursues his or her individual dream with an exceptional sense of determination. When you meet them, they look normal, they seem normal and they may act normal. That’s where normal ends! Those “outliers” carry a nonstandard, burning passion within them that surpasses normal imagination. Last week, one such individual graced our door in Golden, Colorado. Talk about high energy! New York City could harness his high-voltage life to their power grid to run it for a full year. Dorian Anderson, lean, black-haired, brilliant smile and replete with a vigorous personality, set out on January 1, 2014 on a cold snowy day in Boston, Massachusetts to bicycle 15,000 miles around America in search of every bird species in the lower 48 states. He called his quest “The Big Year” which allows him to seek out and photograph as many of the more than 700 species of birds thriving in America. After Stanford, he attended New York University where he completed a Ph.D. in Developmental Genetics. He studied how cells in the early embryo polarize and how this polarization event functions to control subsequent morphogenetic movements during gastrulation. Ironically, it was in the most urban of environments that his birding interest became obsessive. After NYU, he accepted a post-doctoral position at Massachusetts General Hospital and Harvard Medical School in Boston to investigate the molecular mechanisms that control neural plasticity. He offers brilliant bird photographs from his bicycle pursuit of our fine-feathered friends. His daily updates relive his adventures in bird-watching. 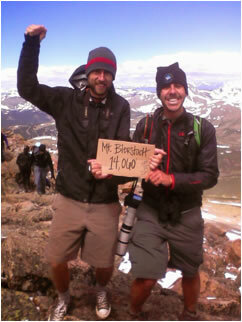 Since we are members of www.warmshowers.org, Dorian picked us out as hosts after he climbed Guanella Pass and summited 14,100 foot Mt. Bierstadt on the Continental Divide. 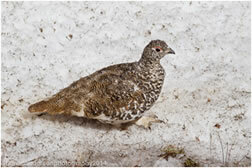 At that altitude, he captured a ptarmigan at 13,500 feet. At 8,000 miles into the journey, he registered that bird as number 488 on his list. He rolled into our house in the evening for a hot shower, conversation and bed. Next morning, we bicycled up to the top of Bergan Park, near my house, to seek out a specific dead tree that housed a family of Williamson Sapsuckers. We heard the hungry brood calling out to their parents for more food. Within minutes, a beautiful male appeared carrying grubs in his beak. 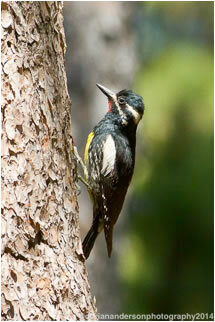 He sported black back feathers, yellow/white underbelly and red tuft on his neck. His leg feathers looked like an Indy 500 finishing flag. Anderson pulled out his 200 mm camera lens for the perfect shot. Later, the mother sapsucker appeared with another beak-full of grubs. Andersons registered a Williamson’s Sapsucker at number 489. As I sat there with this bird-watching enthusiast, I felt his reverence for the natural world. He spoke about preserving birds, butterflies and all living creatures. Why take such an enormous trip? “During a “Big Year”, a birdwatcher attempts to see or hear as many bird species as (s)he can in North America in one calendar year,” said Anderson. “This endeavor begins on January 1st and, depending on the level of commitment, can require the birder to visit all corners of the continent during the subsequent 364 days. The most ambitious Big Years typically record between 700 and 745 species of birds while logging well in excess of 100,000 miles of plane, car, and boat travel. “Biking for Birds is my completely crazy and hopefully fantastic twist on the traditional North American Big Year. 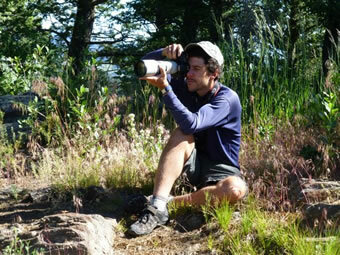 During 2014, I will travel only by bike, foot, and kayak as I move about the continent in search of birds. My movements will be unaided by petroleum, natural gas and electricity. I will not have a support vehicle; everything I need will be carried on my person and my bicycle. This Big Year permutation will certainly add an unprecedented level of adventure to the endeavor, and it should set a new standard for environmentally sustainable travel. After spotting and photographing the sapsucker, I felt an enormous sense of adventure with Dorian Anderson. He elevated my appreciation for our fine-feathered co-travelers on planet Earth. When you visit his site, you may enjoy lively adventure chatter, brilliant bird photography and a place to send your donations to The Conservation Fund and American Birding Association. Later in the day, we visited Buffalo Bill’s Grave. Soon after, we traveled on our loaded touring bikes down the fabled “Lariat Loop” on Lookout Mountain into Golden, Colorado. 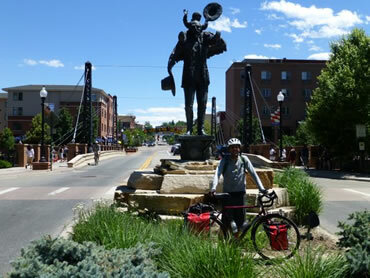 After lunch at a sandwich shop, Dorian headed north on Route 93 toward Boulder.